Alternatives to Great Sights - Has Anyone Been To...? Travel is cheaper, easier and more comfortable than ever. Whole new swathes of the globe are opening up to us, but there are a few spots that it seems everyone wants to see. While it’s great that anyone can now afford to visit their own must-see destination, it is unfortunate it leaves some landmarks with all the romance and mystery of rush hour at the train station. Long queues, strangers in your photographs and a definite sapping of any intrepid spirit you may have felt can all conspire to leave the highlight of your travels looking decidedly like the low-light. HasAnyoneBeenTo… has hunted out some lesser known destinations that can more than compete with the most visited sites. They aren’t ever going to replace these unique big hitters, but if crowds really fill you with dread, these are astounding places without the tourists. Read on for our alternatives to great sights. This is one of the few alternatives that actually surpasses the original in terms of scale. Officially the largest canyon in the World, this enormous geological feature is tucked away in the Tibetan Himalayas. It’s about three times deeper than the Grand Canyon and over 6,009 metres at its deepest. This is not a sight for the faint hearted, but that does mean it’s ridiculously unspoilt. There are whole stretches that no one has yet managed to travel on foot, and it is billed as kayakers Everest. Getting there: Take a bus from Lhasa to Bayi Town, then the next day take a bus to Pe. There is a checkpoint on this road, so make sure you have any necessary permits. When to go: May to October is the best time of year; October to June can be very snowy. With 1.5 million tourists visiting Angkor Wat in 2010, getting it to yourself isn’t the only problem. The World Bank and UNESCO have both warned that the huge numbers of tourists are destroying to very sight they are coming to see. 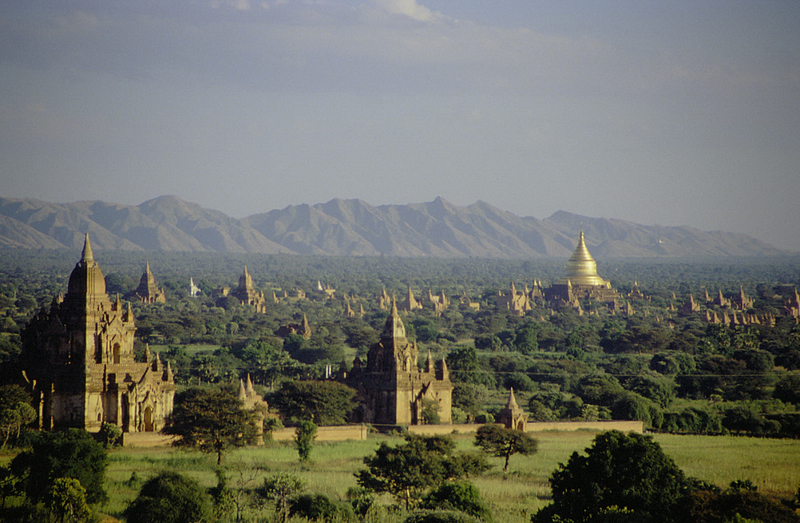 With half that number of tourists entering Myanmar each year, and far fewer making it out to Bagan (or Pagan) on the banks of the Irrawaddy, you can rest easy visiting this sprawling complex of over 2,000 temples. Bagan’s heyday spanned 200 years, from around 1000 to 1200 CE, and the sites are still holy so show suitable respect while wandering around. Getting there: Bagan is a long way from popular towns and cities, but it is well-connected. New Bagan, where you’ll likely end up staying, has an airport for internal flights from Yangon and Mandalay. If, however, you want to retain those green credentials, several ferries make the journey from Mandalay, as do trains and buses. If travelling from Yangon, only slow, overnight trains and buses run. When to go: April to September is the hottest time of year and probably best avoided, but it will be hot and sticky all year round. This church, officially called Cathedral of the Resurrection of Christ, gets its more common moniker from being built on the spot where Tsar Alexander II was assassinated. This fact does give away one crucial difference between this astounding church and it’s more famous sibling in Moscow- it’s age. This church is a wonderful example of 16thCentury Yaroslavl religious architecture, yet it its building only commenced in 1883. The interior is as stunning, and frankly garish, as the outside, with every inch covered in fine mosaics: over 7,500 square metres of them. In an ironic twist, after the revolution, the church was not only closed for worship, but in fact opened as a museum celebrating the very act the church was commemorating. Even that didn’t last long though, as Stalin decided a celebration of the assassination of the head of state might bring trouble upon himself! Getting there: Unlike most of the great sights featured here, this one is right in the city centre. Just off the famous Nevsky Prospect, it is easily reachable by Metro, buses 3, 7, 22, 27 or trolley-buses 1, 5, 7, 10, 11, 22. 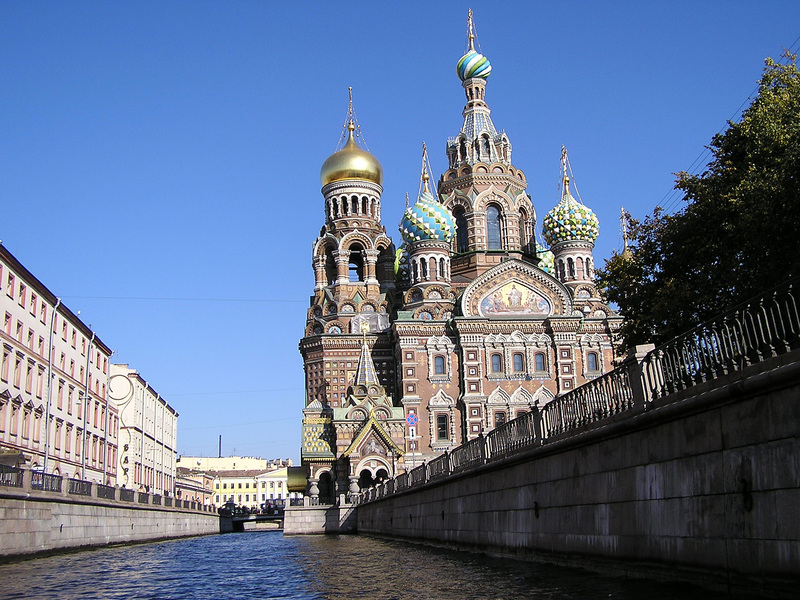 St Petersburg itself is easy to get in and out of, and you can reach it from London by train, or train and ferry in two to five days, depending on how scenic you want your route. When to go: If you’re a fan of the hot weather, June, July and August can not only get above 30˚c, but also it’s the time of White Nights, when the sun barely sets. For a more expectedly Russian feel to the city, April, May and September will be largely dry and possibly snowy, but not the minus temperatures of winter proper. Until very recently, when it was usurped by Poland’s crown wearing version, this was the tallest statue of Jesus in the World. In a fantastic piece of one-upmanship, it was designed to be just marginally taller than Brazil’s famous statue. 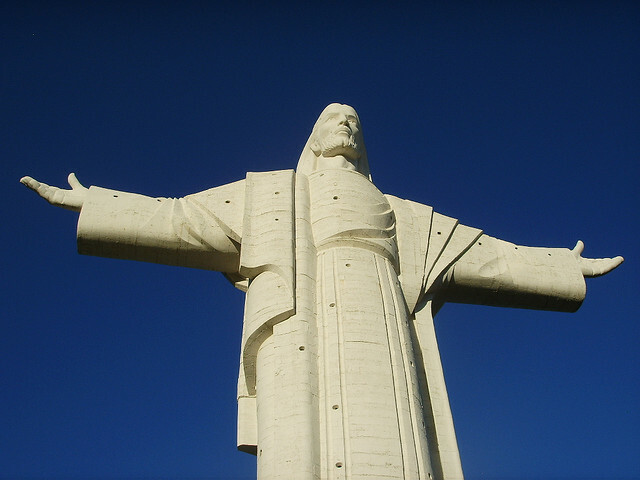 Rio de Janeiro’s is 33 metres tall; one metre for every year Jesus lived. Bolivia reasoned that Jesus didn’t die on his birthday, so he’s 33.3 metres tall, although a full 40 metres including his plinth. While the hill upon which the Cristo de la Concordia stands isn’t as dramatic as the rugged cliffs in Rio, it still gives tremendous views across the city of Cochabamba, which nestles in a ring of mountains doing its photogenic duty. Getting there: The statue is visible from all across Cochabamba, and is only a fifteen minute walk from the centre. There have been reports of muggings taking place on the steps up to the statue, but it does seem these have been passed from guide to guide without necessarily still being true. There is a cable car up to the top of the hill though, which is safe and far less tiring. Cochabamba can be reached from La Paz by either a spectacular through-the-mountains flight, or a long, jarring bus ride of seven or eight hours. When to go: Cochabamba’s other name is the City of Eternal Spring. As you can guess, there isn’t really a bad time to go, with a year round average of 20˚c, but if you want to see more of Bolivia, the rainy season can knock whole areas out and runs from December to March. Now nobody’s denying that the Iguazu Falls aren’t incredible, both in terms of scale and location. However, there are thousands of waterfalls out there, so why all crowd to the same one? 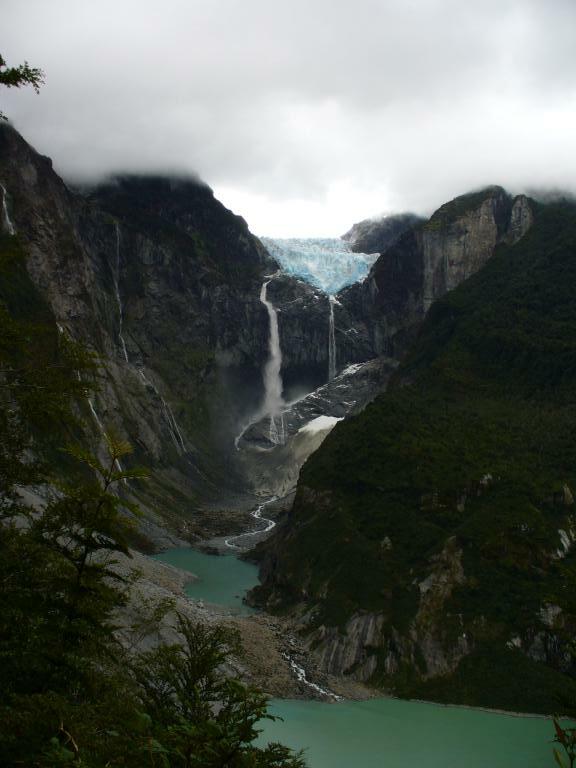 The Cascada de Ventisquero Colgante, rather better known as Hanging Glacier waterfall, is pretty new as waterfalls go, created by the melting of the huge glacier that juts over the cliff edge. It’s just starting to hit the tourist trail in Chile, so get there now before everyone’s heard of it. It’s also huge- while estimates vary, the World Waterfall Database lists the drop to be at least 1,800ft, but most likely over 2000ft. That doesn’t quite live up to the world’s highest, but is somewhat more impressive than Iguazu’s 259ft. Getting there: Located in the beautiful Queulat National Park, a largely undisturbed natural area with a few discreet roads granting access, the waterfall is served by several well-marked hiking trails. For those with trouble hiking, one viewpoint is accessible by road. From April to September, the park rangers also offer boat trips on the lake at the bottom of the falls. The nearest town is Puyuhuapi, and the waterfall is about 3 to 4 hours walk away. There are also campsites in the Park near to the falls, so you don’t have to make the trip there and back in one day. When to go: The best thing about glacier waterfalls is that they have a pretty consistent flow all year round, so no turning up in the dry season to a dusty valley. However, rainy season can render paths impassable, so it’s best to avoid April to June. Finding an alternative to the Colosseum isn’t hard, but choosing which alternative to go to is. There are famous and striking arenas in areas as diverse as Nimes and Leptis Magna in Libya, but I’ve picked Pula, Croatia. Not only is this an amazingly well-preserved example, it is also a large and an early one. It is located right in the centre of this small and pleasant city, and has been altered enough to hold summer concerts, but little enough it feels like stepping back in time. It helps that from the arena you also have a lovely view of the sea, and you can really imagine the busy Roman port that first helped Pula grow. Getting there: Pula sits right on the Adriatic coastline, and is reachable either by plane direct from London, with Ryanair doing good deals 3 times a week, or by bus from Zagreb, Rijeka, Split, Trieste, Ljubljana, Belgrade and Venice. Also recommended is getting to or from Pula by ferry straight across to Venice. When to go: April to October are the hot months, but being coastal there’s always a chance of rain. If swimming is your thing, July and August are going to give you the nice warm seas you need. Thanks to the popularity of Greece with tourists of all kinds, and the prevalence of cheap flights there, the Parthenon is one of the busiest tourist attractions in the world, with nearly 2 million visitors a year. While it is impressive, it certainly isn’t the only ancient Greek monument out there. For a bit of a change, try looking in Italy for a different Greek experience. Founded in 600BC, it was originally known by the decidedly more Greek name of Poseidonia. It was taken over by the Romans in 276BC. There is a good museum here as well, with some impressive frescoes from the ruins on display. 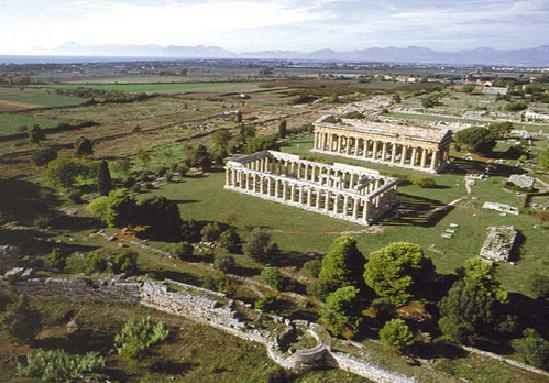 Paestum can’t remain as quiet as is for long. It sits down the road from busy Naples, just a stones throw from the beach, giving even short break travellers the chance to get some city, beach and history in a few days. Getting there: The modern town of Paestum just north of the ancient one is a lovely tourist seaside town, but quite small- get a flavour for it here http://www.infopaestum.it/. There are trains from Naples and Salerno, just make sure they stop at Stazione di Paestum. The ruins are about 15 minutes walk from the train station and it is not lit at night. The best bus line is Giuliano bus, which goes from Naples and Salerno. When to go: There isn’t really a bad time to visit this part of Italy. If you want the blazing hot summer, predictably June to September is your best bet, but while swimming may be off the agenda in January, the weather isn’t going to be so bad as to ruin a holiday. Thanks to http://www.flickr.com/photos/vithassan for the photo. For anyone who has investigated holidaying in Sudan, these pyramids will have been the singularly most highlighted destination. Sadly, however, to anyone who hasn’t looked specifically at Sudan, these pyramids are so overshadowed by their Egyptian inspiration as to be all but invisible. 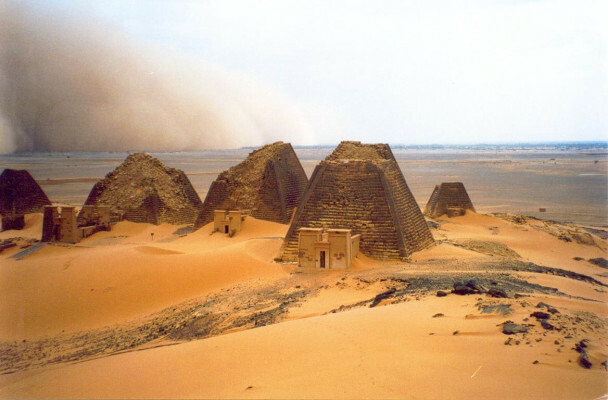 While smaller than their counterparts, there are over 200 of these Nubian examples throughout Northern Sudan, centred at the ancient city of Meroe. Much of the damage has been done not by time, even though they’ve had 2,000 years of sitting exposed in the desert, but by a single Italian treasure hunter in 1834. A handful of new pyramids have been built at the site, to help give an idea of how tall and narrow these tombs were when intact. Getting there: This is probably the hardest of all the destinations listed to visit. Getting a Visa for Sudan can be a long and costly process. Flights in are relatively easy to come by, but ensure all your paperwork is in order to make sure you are let through border control. You also need to get a permit to take photographs in Sudan, and register your arrival within 3 days of entering the country, and at every new town you arrive in. If you do not register, you may not be permitted to leave. Once you are finally in, public transport to the pyramids isn’t easy. You can get a bus from Khartoum to Shendi, and then a bus towards Atbara will drop you near the pyramids, but won’t pick you back up there, leaving hitching back your only real option. A taxi from Shendi is roughly £25, and if you really want to be able to explore, you can rent 4wd’s in Khartoum. Internal flights in Sudan are not covered by any international flight safety protocol, and are often un-airworthy. Do not fly internally if you can help it. Bear in mind, large parts of Sudan are dangerous for travellers, and look up FCO advice before travelling. When to go: September to April is the coolest time of year, and will avoid the wet season, though even that isn’t very wet. November to January can see fierce dust storms blow up. I love your blog- even if I hadn’t read it it’s one of the most stylish I’ve seen. Luckily, it’s also interesting, and can help me learn some Portuguese! 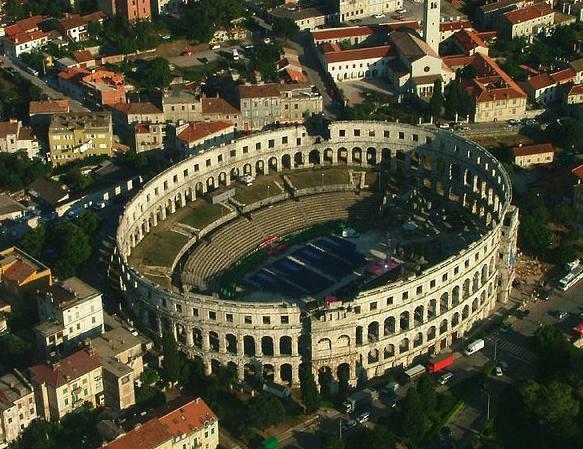 I agree with your Pula pick – I think it is even nicer than the Colosseum! I went to Arles last week and that’s good as well. Thanks Andrew! I love looking through your blog- especially all the Greece photos. It reminds me so much of the all-too-short time I spent living out there.